Brittons will always excel in at least two areas : humor and gardening. The other evening, during a charming Garden Party at the British Embassy in Jeong-dong, I was admiring the flower beds facing the late XIXth Century residence of the Ambassador, when I noticed two almost identical signs at the feet of a young tree. On the left one : "this tree was planted by Queen Elizabeth II in 1999". On the right one : "this tree was replanted by Hong X-X, head gardener, 1986-2011". What could pass for lese majeste (a Korean commoner correcting a Queen's mistake !) is actually a very smart way of honoring the host country and Embassy staff. Another smart citizen of the United Kingdom was Mr William George Aston, the British Consul-General who purchased in 1884 for a song but with his own money the land where the Embassy would be erected. 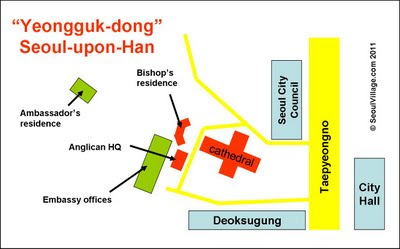 And with less secular British powers headquartered next door (Bishop John Corfe bought the land six years later for the Anglican church), the whole neighborhood could be named Yeongguk-dong (영국동). Technically part of Jeong-dong, Jung-gu, this lovely and peaceful spot can be reached from Taepyeongno, through a short street facing the Western side of City Hall, between Deoksugung and Seoul City Council. The area comprises a rather few but remarkable buildings. 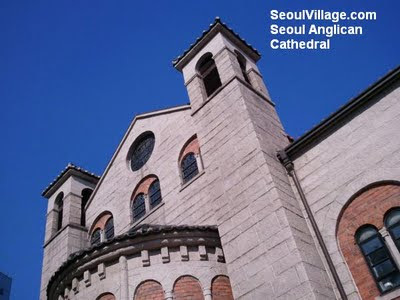 If the Ambassador's Residence is hidden by the concrete bulk of the Embassy's main building (there had to be an architectural faux pas somewhere), the Bishop's residence exposes to the public its unique facade : three sections blending British and Korean architectures, surrounding a massive tree and facing the Seoul Anglican Cathedral, a striking display of romanesque style. As a transition between the Bishop's residence and Deoksugung walls, a large hanok, formerly part of the palace, hosts the Anglican church offices. Note that the Cathedral adds, beyond its definitely Mediterranean touch, yet another fusion element to the mix with the almost Byzantine mosaic illuminating its altar. Few foreign communities contributed so positively to Seoul's skyline : I'd give an A to the Russian Legation (more than ever an undisputed cultural and historical asset), a D- to the US Embassy (they can't do much worse when they move to Yongsan), and a C+ to the Ambassade de France (where Korean architect Kim Chung-up erected an ambitious yet indigestible Corbusieresque hanok-bunker). Of course, the longest lasting footprints are the ones Seoul is leaving on us. But even there, Brits had a head start : the Royal Asiatic Society Korea Branch (RASKB) has been promoting Korean culture since 1900.